Exposes all sorts of weird data. Mozilla team has conducted a survey that aims to learn more about the user browsing habits. Data submission: 527,817 test sets submitted in November 2010. 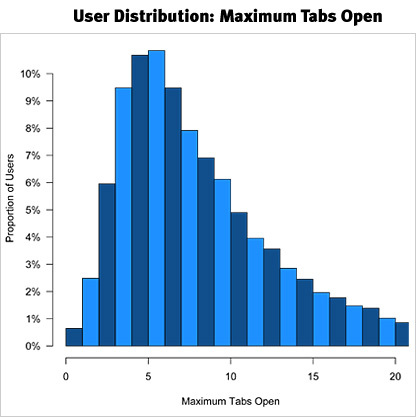 This survey basically says, that hardly anyone has more than 10 Tabs opened simultaneously with Firefox… (I usually have between 40 and 100 open, but I use Opera, so I am not target of the survey) ok, understandable, because than you have to scroll the tab bar and that is very user-unfriendly. Furthermore: Fx 4 is introducing this Panorama-Tab-Grouping for whom again? a whole new interface for a dwindling small share of the users? I would be interested how the graphs would look like in Opera (as Opera lacks the scrolling tab-bar problem), but I would expect it not to change that much. Tab stacking/grouping/Panorama/whatever seems to still be a feature targeted at a very small group of users. Andylee, did it ever occur to you that Panorama might change user behaviour? 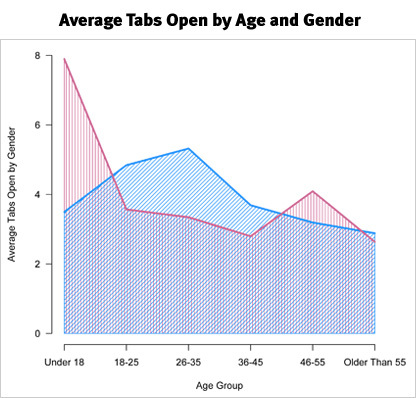 How many browser windows did the everage user have open before Firefox made Tabs big? Panorama is good ONLY for research purposes. Thats all. Almost nobody will use it for everyday browsing. FF change users behavior? No, it didnt. When majority was using IE, they had about 3-4 windows opend at the same time (from my personal experience). So the average is stil the same. 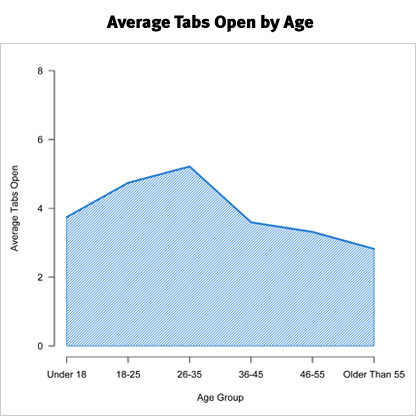 Tabs just give your an option to be more convenient when you have more web pages opened. But behavior of majority people still havent changed. Panorama is, like Google Wave, a solution looking for a problem. As a Firefox user, it’s frustrating to see Mozilla wasting resources on this. There not even wasting resources,Mozilla has different teams working on different stuff. Considering that Firefox slows down when you open more than a couple of tabs… not surprising!